SARATOGA SPRINGS, N.Y. – Temple Sinai welcomes back Saratoga Jewish Community Arts Storytelling April 26. 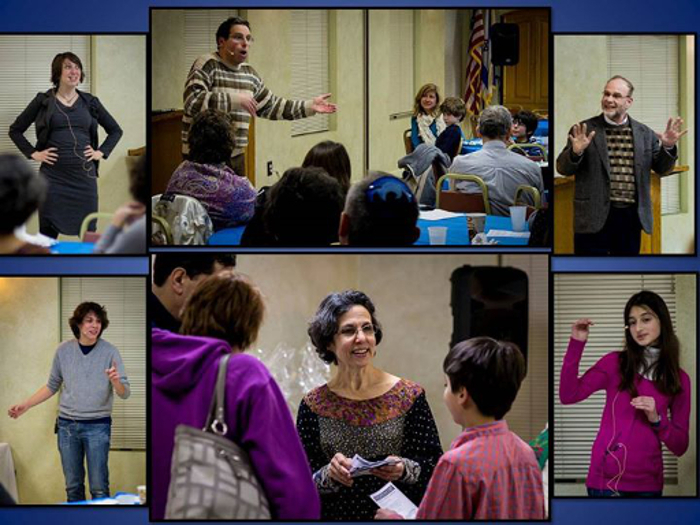 The evening program, made possible with the generous support of the Jewish Federation of Northeastern New York, brings Jewish storytelling to families of the entire community. “To hear a Jewish story is to share the humor and warmth, wisdom and angst, earthiness and spirituality of an ancient and thoroughly modern, diverse and irrepressible group of people bearing a most remarkable history,” said Beth Novik, one of the many storytellers for the event and a congregant of Temple Sinai. The program stories are intended for every age group. Storytelling communicates with different people in different ways, since everyone understands the words differently, explained Phyllis Wang, President of Temple Sinai and Coordinator for Saratoga Jewish Community Arts. Adults understand the sociology and history; while children understand the action. The child and adult may laugh at the same words; however, they did not hear the same story. This can make a storytelling experience appealing to families and other multigenerational gatherings, she said. The major goal of storytelling within Jewish tradition is to inspire people to improve their actions and teach them ethical understanding. Stories have been a powerful tool to tell the “happenings” of the Jewish people. Stories crystallize the Jewish national spirit. This year storytellers include a group of popular storytellers that will include returning storytellers from 2014 Sandy Schuman, President of Executive Decision Services LLC, author, facilitator and communications specialist; Shawn Banner artist, teacher of art and educator focusing on math intervention; and Beth Sabo Novik facilitator, teacher and transformational speaker. They will be joined by new storytellers Jeannine Laverty, Siri Allison and Kelvin Keraga. 2 Shevat 5776 – January 12, 2016 Temple Sinai Comments Off on Story Telling is Magic!